CIPS is fortunate enough to have at its helm, Prof. Rama Rao Nadendla, who officiates as the Principal. He is having 26 years of teaching and research experience. He was the recipient of "Best Research Paper" award for the year 2001 from IJPSC (Indian Journal of Pharmaceutical Sciences). He has published / Presented more than 65 research / review papers in various National / International Journals, National / International conferences. He acts as Editorial Advisory Board member of International Journal of Pharmaceutical Excipients, The Pharma Review (2003 to 2007 ) and Journal of chemicals and Pharmaceuticals. He is also an advisory board member of Enar Foundation Research Centre, Navsari (India). He has authored 4 popular Text Books in Pharmaceutical and Medicinal Chemistry for Victory, Vallabh Prakashan, New age International and Mac Millan and Pharmabook Syndicate publishers. 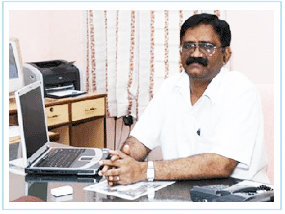 He acted as Chairman, BOS in Pharmacy course,(2005-2008) Acharya Nagarjuna University and Secretary, AP-APTI (2004-2007). He is appointed as Dean Faculty of Pharmacy of Acharya Nagarjuna University and Member BOS for Pharmacy Courses of Krishna University Machilipatnam.